When I cook, I try not to add more fat that I should. While Cornelius could stand to “fatten up”, I’m always trying to fight the good fight. I’ve always been quite content and even pleased with how many dishes have turned out when I’ve used skim milk instead of cream or done away with adding butter or added cheese. But sometimes you’ve got to give in to the primal urges of forbidden foods. As I looked in my fridge and tried to figure out what I’d make for dinner, I had already half way decided to make Kayak Soup’s Healthy Spring Pasta…but then something in me snapped. I always end up making the healthy version of something (not that there’s anything wrong with that at all). This time, I wanted to be bad and endulge in something naughty. So I walked over to the corner grocer and picked up a small bottle of heavy cream. My dinner plans were set. Oh my…so worth every fantastic calorie! 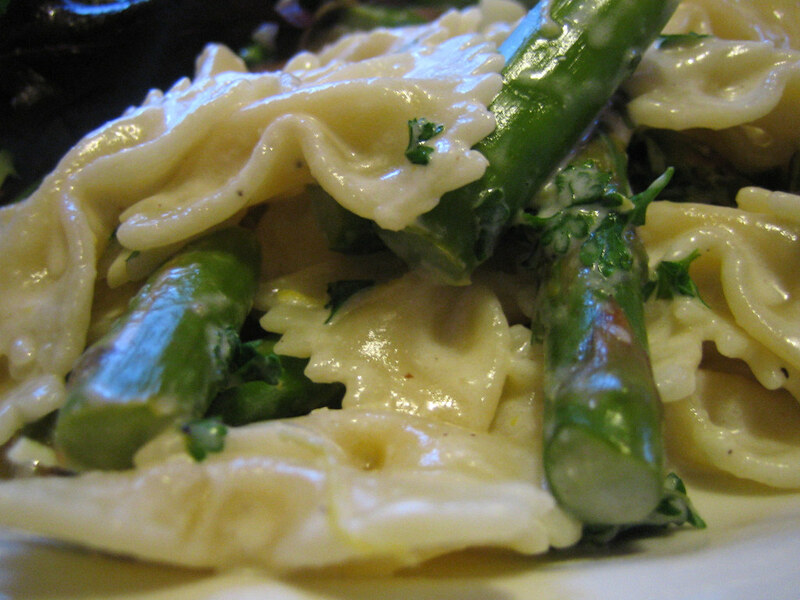 The sauce tasted light and lemony and the tender asparagus was sweet and perfect. When dinner was done, I was tempted to lick the pot when it was empty. Who am I kidding…I most certainly licked it all up. Definitely a springtime treat. 1. Prepare asparagus by snapping off the bottom tough ends & then snapping each stalk into 1 inch pieces. 2. In a large pot, boil water and add 1 heaping teaspoon of salt. Add pasta. When pot comes back to a boil again, put prepared asparagus into a large metal colander, place over the boiling pot and cover the asparagus with the pot lid. One and a half minutes into the steaming process, take tongs and gently toss asparagus, replacing lid for another one minute and a half. Remove colander and rinse asparagus under cold water until cool. The asparagus should be crisp-tender. Drain well and set aside. 3. In a smaller pot, combine lemon juice, butter and cream over moderately low heat. Stir in zest then remove pot from heat and stir in 1/4 cup of the pasta water into the cream sauce. 4. Drain pasta and return to pot. Add in the asparagus and parsley and combine well. Add the cream sauce and parmesan chees and cook over moderate heat, tossing until heated through. Taste and add remaining salt if necessary. « what does your grocery haul look like? LOL, the best of intentions, eh? This sound so delicious! I love asparagus and lemon together. This sounds absolutely fabulous, and I like the combination of lemon and asparagus. I try to eat as healthily as I can, too, but sometimes it’s healthy to indulge. I’ve made a dish quite similar to this with the addition of smoked salmon. And no, I didn’t skimp on the cream, either! Oooh, this sounds good. One of the veggie restaurants here in Austin serves something like this…I bet it tastes just as yummy! Thanks for the recipe. Totally true, Linda, but so worth every bite! Tania, I couldn’t agree more completely. And I love the idea of adding smoked salmon! Yum. Crystal, this is definitely a restaurant quality dish! Ah, it feels good to give in, doesn’t it? Oh! That pasta looks gorgeous! Hi, this looks like something that I made recently, and it was so excellent. But, I used some ultra low fat cream cheese in a tub (you know the stuff I mean?) instead of real cream–and I swear it was almost the same. Just a thought for next time. And I’m going to go roll myself some new pasta and try this tonight! dawna, it was worth every caloric splurge! ivonne, it tasted better than it looked! thanks, beth, i think it was worth the splurge. darien, i’ll definitely try a lower-fat version of this again. thanks for the suggestion!